This is the Extra service area on the M25. For the service station on the A2 in Kent, see Cobham (A2). 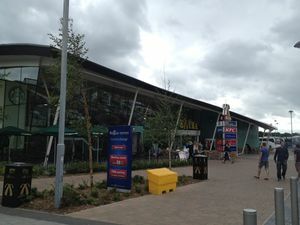 The M25's much-needed fourth service area finally opened in September 2012, bringing brand-spanking new and absolutely huge facilities to the south-western corner of the London Orbital. First three hours free for all vehicles, after which you must pay £35 per 24 hour period. Parking tickets can be bought from machines located in the car park and the main building and can be paid in either GBP or Euros. Inside the main food court. A Coach Toilet Drop facility was added to the Shell garage, free for coaches with 25 or more passengers. The filling station is operated by Shell. At night, the coach park officially doubles-up as an overflow lorry park (this tends to happen at most services against their will, but Cobham is currently the only one to embrace this). On the evening of 21 February 2016, the services were forced to close after a small car meet going viral on social media. 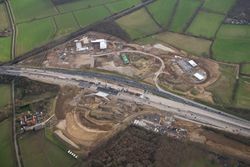 Over 3000 people descended on the services causing severge tailbacks on the M25 and filling the car park - news report. The services received a lot of media attention in June 2017, following a fatal assault in the petrol station. Roadworks to make space for the services. During the same week as Cobham receiving planning permission, Beaconsfield services on the M40 were too. Upon granting the permission, John Prescott said there was a "a clear and compelling need" for it. Despite this, it was very controversial, especially as the site was built on green belt land at New Barn Farm. The services themselves are built to the south of the motorway, with an underpass allowing eastbound traffic to access them. An opening ceremony was held on 6 October 2012 to mark the opening of Cobham - details. The services consist of one very large amenity building and an equally large petrol station. 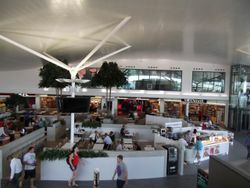 The amenity building (signposted as a food court) is similar to most Extra services in that it has the main units spread out around a central atrium, with toilets at the back. The hotel is then built-in at the side. A number of temporary-style units are placed in the middle, amongst the seating. In 2016, significant changes were made to the road layout at what used to be a standard roundabout used to enter and exit the services. While the original layout was praised for its efficient and simple design, it proved to be crippled by the heavy weight of traffic and by motorists' forgetting which direction on the M25 they were using. As a result, the new layout has many signs, each with a heading pleading "PLEASE GET IN LANE". When the plans for the services first went public, the services were going to include an LP4 restaurant and an Etap Hotel but these were replaced by Welcome Break's Eat In and Days Inn respectively. This was the first time one operator's own creation has been introduced to a rival service station. The Eat In restaurant was the last remaining Eat In restaurant to close on the motorway network in June 2015. It was replaced by Harry Ramsden's, Papa John's Pizza and Tossed which all opened on 7 July 2015. A Costa Express machine and Krispy Kreme counter are also run by Welcome Break and can be found in this area and paid for at Harry Ramsden's. The Starbucks café, which was the largest in Europe when it opened, is also operated by Welcome Break. Greggs, West Cornwall Pasty Co and M&S Simply Food are run by Moto. A Krispy Kreme cabinet can be found next to West Cornwall Pasty Co. The services used be the only services to offer both Starbucks on the Go as well as Costa Express machines, both under one roof. The Starbucks on the Go machine has since been replaced by a Nescafé Alegria machine. A Nando's restaurant opened here on 29 November 2017 in a new extension to the main amenity building. Papa John's Pizza closed in April 2018 and was replaced by an extended refurbished Tossed unit which opened in May 2018. The new Tossed includes self service order points. During April 2018, the Mint Leaves unit here was removed and was replaced by WrapChic which opened on 1 August 2018. A new Pizza Express, which is operated by Welcome Break, opened in March 2019 and is accessed from both the front of the main building and within the existing Welcome Break area as it is based in another new extension between the main building and the Days Inn hotel. In January 2019, Shell introduced a Jamie Oliver Deli by Shell kiosk at Cobham.